Book Review: A JOURNEY » Ambassador Fabian’s blog, KP Fabian, Analyst - international political developments, global issues, Indian national issues. Tony Blair became Member of Parliament at 30, Leader of the Opposition at 43, and Prime Minister at 47. His was the youngest family to live at 10 Downing Street in 150 years. “On 2 May 1997, I walked into Downing Street as prime minister for the first time. I had never held office, not even as the most junior of junior ministers. It was my first and only job in government.” The lack of governmental experience was to produce disastrous results in the area of foreign policy. Ten years later, Blair, loathed by the media and also by a substantial section of the public, was compelled to resign by his party. His subservient alliance with George Bush on Iraq and Gordon Brown brought his downfall. As part of a political bargain, Blair was to have resigned much earlier in favour of Brown. 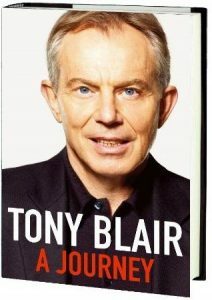 Blair has done exceedingly well, commercially speaking, with his book. Over 92,000 copies were sold in the first four days of publication. In contrast, the reaction from certain sections of civil society was rather hostile. Protesters in Dublin threw shoes and eggs at him. A function at the Tate Gallery had to be cancelled as angry protesters gathered. The street protests are mainly by those who opposed the war on Iraq. Let us look at the argument as advanced by the author on his war on Iraq to which he has devoted more than a hundred pages. The reader naturally gets the impression that Blair had played a pivotal role in convincing an otherwise unwilling and uninterested Clinton to take military action against Slobodan Milosevic. The reviewer went through Clinton’s My Life and did not find anything to corroborate the account given by Blair. It is true that Clinton encountered opposition in the U.S. Congress to his decision to get involved militarily in the Serbia-Kosovo conflict. Blair was a protagonist of military action, and in appreciation a number of boys in Kosovo were named after him. But Blair’s narration is too egocentric to be historically acceptable. In no standard account of Kosovo’s separation from Yugoslavia is there any mention of Blair’s role in persuading Washington to get engaged militarily. We should note, though Blair does not draw attention to it, that the NATO military intervention was not based on any U.N. Security Council resolution. This also has a bearing on Iraq. We now move to 9/11. When it happened Blair thought that it was the work of a “small group of fanatics wholly unrepresentative of Islam who could and should be crushed”. Later, he came to realise the “scale of challenge” better: In the mindset of modern Islam there is one spectrum. At the farthest end are the extremists who advocate terrorism to further their goal of an Islamic state, a rebirth of the Caliphate. They are few in number but their sympathisers are many. While many do not agree with terrorism, they ‘understand’ why it is happening. Then there are those who condemn terrorism but agree that the U.S. is anti-Islamic and that the invasion of Afghanistan and Iraq is an invasion of Muslim nations. They see Israel as a symbol of Western anti-Islamic prejudice. This group stretches uncomfortably far into the middle of the spectrum. Of course, the majority condemns terrorism, but they have not found a way of articulating their point of view. Therefore, the battle is not between an unrepresentative group of extremists and the rest of us. It is also a fundamental struggle for the mind, heart and soul of Islam not confined to any electoral cycle, but lasting a generation. There were, Blair argues, two ways of responding to 9/11. One, to confront it militarily as was done. The other was to manage it, leave the Taliban in power, but ring them with sanctions and alliances. The strategy of military confrontation inevitably leads to nation building. Blair concedes that we still do not know which of the ways is the better one, but he chose the first, based on his instinct and belief. He is not surprised that the war on terror has not yet ended. On 9/11 itself Blair told his nation that it was not a battle between the U.S. and terrorism, but between the free and democratic world and terrorism. And that Britain should stand shoulder to shoulder with the U.S. When 9/11 occurred Blair decided to go to New York and Washington after establishing his position “as the world leader strongly articulating the need for comprehensive and strategic action”. For that purpose, he talked to his counterparts in Germany, France and Italy before going to the U.S. In Washington, Blair found Bush “at peace with himself” and admired him for that. From Washington, Blair went to Brussels for an emergency meeting of the European Council. He could speak there with authority about what he had seen in New York and Washington. The reader will note that there was a deliberate, well-thought-out strategy to find a leadership position for Britain and himself. Blair went to West Asia, Russia and Pakistan. Pervez Musharraf told him that nuclear weapons and Kashmir dominated Pakistani thinking. Blair notes with sadness that the original moral force with which the military action in Afghanistan was undertaken got dissipated. He does not know how long it will take to complete the task. But it should be accomplished whatever be the cost. Kosovo and 9/11 prepared Blair for decisive action against Saddam Hussein. The author sets himself a modest task while starting the section on Iraq. “I have often reflected as to whether I was wrong. I want you to reflect as to whether I may have been right.” However, the modesty is soon discarded. Blair’s argument reminds one of suppressio veri, suggestio falsi – the suppression of truth is the suggestion of falsehood. Given that over 92,000 copies were sold in the first four days, Blair has felled a large number of trees to argue a case that is seriously flawed. In January 2003, President Bush, in his State of the Union message, repeated the above sentence. The documentary evidence handed over by U.S./U.K. was checked by the International Atomic Energy Agency (IAEA) and in March 2003 it said that the documents were forgeries – the signature of the President of Niger looked like a child’s scrawl. The stationery used was of 1980 vintage and there was a signature as Foreign Minister by a man who had ceased to hold that office 14 years before the date of signature. On March 14, 2003, the CNN carried a story by David Ensor that it was a “world class embarrassment for U.S./U.K.”. The same U.K. dossier contained the notorious “45 minute” claim, namely, that Saddam could assemble and deploy WMD in 45 minutes. There was no substance to it and it was a lie. Blair has argued that even if he had known that there were no WMD with Saddam, he would still have invaded Iraq. The argument goes like this: The UN inspectors would have cleared Saddam Hussein; the sanctions would be lifted; given the huge oil revenue and the scientific talent that Iraq had, Saddam Hussein would have gone ahead with his suspended plans for WMD and nothing could be done to prevent him from getting the bomb; and therefore it made sense to invade Iraq before the U.N. cleared him. The argument is that Saddam had the intention to make WMD. Let us assume that it was the case. Let us not ask Blair how he is so sure about the matter. Was it not possible to lift the sanctions as part of a deal and flood Iraq with IAEA inspectors with unlimited access? Blair is unconscionably self-serving while dealing with U.N. sanctions on Iraq. He says that Saddam was free to buy “as much food and medicine as he wanted”. This is a facetious assertion. Blair knows well that food and medicines are not enough to maintain good health. He knows that safe drinking water is a must. He knows that the U.N. Sanctions Committee was not approving Iraq’s request for water pipes as it was argued that it was a ‘dual-use item’ that might be used for military purposes. He should know that at one time the committee was not passing pencils as the lead could be used for other purposes. Blair says that by 2003, as much as 60 per cent of the population was dependent on food aid; millions were malnourished and millions were in exile. He quotes the U.N. to point out that by 2002 the under-5 mortality was 130 per 1,000. By 2007, thanks to the coalition, the figure had fallen to 40 per 1,000. “The difference equates to 50,000-60,000 children’s lives saved each and every year.” The reader will be puzzled to note that Blair does not explain how he arrived at these figures. Since Blair has selectively quoted the U.N., it will be pertinent to recall that the UNICEF, in a survey published in August 1999, gave cogent evidence for its conclusion that 500,000 children had died because of sanctions between 1991 and 1998. The sanctions were genocidal. Perhaps Blair does not know or even care to know that an Iraqi was getting, under sanctions, food worth $6 a month when the U.N. expert monitoring the food distribution was making $100 a day paid from Iraq’s funds. To compare the 2002 and 2007 figures without bringing in the sanctions that were effective from 1990 to 2003 and to attribute the improvement to the coalition does not show much respect to the reader’s intelligence. The reader is rather intrigued that there is no clue whatsoever of the spell that Bush exercised over Blair to make him ‘an attendant lord’, to put it mildly instead of referring to him as George’s poodle. Blair has stated that Bush started thinking of invading Iraq only after 9/11. He could not be more wrong. Blair should have read Bob Woodward’s Plan of Attack, published in 2004, wherein it is stated that even before he formally took office Bush, while being briefed at the Pentagon, specifically asked about the status of plans to attack Iraq. Subsequently, the Secretary of Defence was to put immense pressure on the Pentagon to update the plans and to make presentations to the President from time to time. Focussing on Iraq alone will be unfair to Blair. His 50-page account of the Good Friday Agreement has many lessons for the Indian reader. The government and the opposition decided not to politicise the issue and to work together. The ‘decommissioning’ of weapons with the Irish Republican Army (IRA) is of particular interest in the naxalite context. Bringing peace to Northern Ireland was a historically significant achievement of Blair. The G8 met at Gleneagles Hotel in Scotland on July 6, 2005. Prime Minister Blair presided. The next day, four British Muslims carried out coordinated suicide bombings in London, killing themselves and 52 innocent persons. Blair responded by tightening security measures, which his critics said diminished civil liberties unnecessarily. It is now known that the intelligence had warned Blair that his policies on Afghanistan and Iraq might attract retaliation from terrorists. Tony Blair is 57. He has a long political life ahead of him. He is currently engaged in resolving the Israel-Palestine question as a representative of the Quartet. He might or might not succeed in it. But, a comeback to British politics is unlikely. Britain and the Labour Party have moved on and the Blair legacy has been dismantled to a great extent. Blair’s book should be read more for an insight into the type of human being the British democratic system exalted to power for 10 years than for learning what happened during those 10 years and why. That he won three general elections in succession is a commentary on the fallibility of democracy and, of course, on Tony Blair’s own superb political skills if politics is all about who captures power from whom and retains it for how long.